Teenage Mutant Ninja Turtles is a franchise that many of us are familiar with, and for many people who grew up in the 80s and 90s, or even early 2000s (for the 2003 version), it was a huge part of our childhood. It however, was not really a part of my childhood. As blasphemous as it is to say, I never really enjoyed any of the incarnations of TMNT. The movies either looked creepy or had crappy CGI or were produced by Michael Bay. The 1987 version was colorful and eye-catching for a young kid, but it never held my interest. The 2003 version took itself far too seriously and was trying to be dark and gritty, ironically the style of show that the original TMNT comic was parodying. So when I heard that there was a CGI animated TMNT cartoon coming out on Nickelodeon, I scoffed at the notion and pretty much ignored it. Recently, however, I did end up giving the new 2012 version a try. I watched a few episodes. Then a few episodes more. And within a month I had watched the entire first two seasons. Much to my surprise, I had found a really good show! I must admit that I have only basic knowledge of the previous incarnations of the franchise, and unlike some others on this site, I was never previously a big fan of TMNT. So with that in mind I apologize for any redundancies in descriptions of characters or events. But also with that in mind, the 2012 version of Teenage Mutant Ninja Turtles is so far the only Ninja Turtles to catch my eye and keep me watching. Color coded for your convenience. First let’s talk about the characters. We all know them: Leonardo, Donatello, Raphael, and Michelangelo. They keep with the previous archetypes that they have been dealt with in other versions – the leader, the smart one, the angry one, and the goofball, respectively. What first stood out to me in this version of the turtles compared to the others is that they all looked different. They had different skin tones, different eye colors, different facial and body shapes. Each of them had certain identifying characteristics, Leo’s eyes look thinner and more wizened, Donnie has a gap-tooth, Raph’s shell looks more beat up and chipped, Mikey has bright blue eyes and freckles. You could take their masks and weapons away and you would still be able to tell who is who. I really love this artistic attention to character design, and it not only makes them all look interesting and unique, but it exemplifies their personalities. I also enjoy their interaction with each other, with lots of brotherly jibing. The comical back and forth between the brothers, and between the turtles and their enemies is classic superhero banter at its best, and feels like a throwback to the 80s version (though this time with less “cowabungas” and more “booyakashas”). The voice actors who lend their voices to the characters are also brilliant. Firstly we have Rob Paulsen voicing Donatello, who’s voice acting skills are legendary, and who previously voiced Rapheal in the 80s version. This time around Raphael is voiced by Sean Astin (he played Samwise in The Lord of the Rings), which at first I thought was a strange choice in casting. But Sean Astin makes a great voice actor and is able to put forth a substantial amount of force in his lines to keep up with Raph’s volatile personality, but also knows where to calm down and put forth softer emotions. Greg Cipes obviously took his role as Beast Boy in Teen Titans as inspiration to voice Michelangelo, since his experience as a comic relief character shines through. Leonardo is perhaps the only hiccup in the amazing voice acting that happens here. It is not that he has bad voice acting (quite the contrary), it’s just that he has had a total of three different actors throughout the series so far (Jason Biggs, Dominic Catrambone, and Seth Green). The voice change is explained in the series, which makes sense… I suppose… Anyway, if you like voice actors, this series certainly has a star studded cast with many fantastic cameo voices (Tom Kenny, Gilbert Gottfried, and Phil Lamarr to name a few). But enough about the characters. What about the plot? As I understand it, this rendition of TMNT deviates a good amount from previous ones. Their story in this version begins with the turtles’ 15th birthday, or “mutation day” rather, where Master Splinter (Hoon Lee) finally allows them to leave the sewers and explore New York City above. On their first night out they discover pizza, the joy of jumping around rooftops, and a girl named April O`Neil (Mae Whitman) and her father getting kidnapped by some strange men. They go to help April and soon discover an alien race known as The Kraang (Nolan North) (not to be confused with the singular alien, Krang, in the 80s version) who not only created the mutagen that originally mutated the turtles, but are also planning on taking over the world. And they need April O`Neil to do this for some nefarious and undisclosed reason. A majority of the episodes and story arcs are dedicated to this plot-line. We of course also have our other main villain, Shredder (Kevin Michael Richardson), who has his usual vendetta against Splinter and the turtles, yet many of his episodes are separate from the Kraangs’. It is interesting to me that the writers decided to split the world-saving plot with the Kraang, from the more personal threat posed by Shredder. It juggles well, the turtles’ need to protect the Earth, but also to protect their family. The character of April is very different in this version as well. She is no longer the twenty-something, damsel-in-distress journalist that she was in other versions. 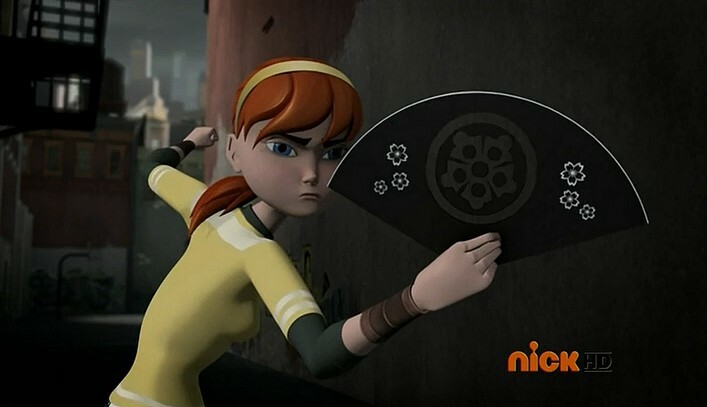 Instead, she is a young, high school girl, and is very central to the Kraang plot. I think that her age was lowered for a few reasons. One was to have her be more of a peer in age, to the turtles, and two to be more relatable to the younger audience that is the target of the show. It works, and I really like this version of April, who feels less of a damsel in distress and more like someone who has the ability to take care of herself if need be. She even gets martial arts lessons with Splinter. Plot-wise, you can tell a lot of thought was put into the development of the characters and world. Yes, they were taken from previously created ideas, but the expansion on them in this series really made me fall in love with it. April O’Neil gets a reduction in age, but an increase in badassery. It was surprising to me that I liked the show so much, but what was probably more surprising about it is that I liked the art! I am strongly biased against CGI cartoons. Yes, it can be done right, as we’ve seen with Pixar and some Dreamworks films, but I mostly see it as shortcut to make cheep, quick, and easy animation. I especially see this in TV shows. However, the CGI animation in this series, actually does a good job, and I can tell that effort and budget was definitely put into it. As I previously stated, the detail to character designs, are fantastic. However, this attention to detail admittedly stops when side characters or human characters are involved. I have found that the more plastic-y and fake a human character looks in this show, the more likely they will be turned into a mutant, which the creators tend to pay more attention to artistically. What I’m most impressed with, art-wse, is the backgrounds. They look beautiful. Especially scenes involving backdrops of the city. They look almost as if they are painted on, having a glossy oil paint texture that mimics the sheen of a classic comic book. Left: New York City at night. Right: Splinter’s training dojo. The final aspect of this series that I’d like to talk about was one I wasn’t even expecting, but was extremely pleased to have found, and that is the inclusion of Japanese culture. Yes, they are ninja turtles, and ninjas come from Japan, but it is sadly rare to find any media with martial arts as a backdrop for the story to include cultural aspects of the originating country from which those martial arts came. In the case of this show, I can tell the creators actually did their research. Real Japanese is used very often in the story, mostly through Splinter, who is from Japan. His Japanese is appropriately archaic, as his life in Japan reflected a more traditional lifestyle. Furthermore, there are interesting tidbits into Japanese culture that are brought up in the series, including various martial art concepts, food, and even folktales. Anime and monster movies, such as Godzilla, are also referenced, and some of the more toony expressions of the characters are done in an almost anime style. There are some quirks and things that they get slightly wrong, but I can tell effort was put in here to get the main things right and still be respectful to the culture that it is borrowing from. The original TMNT issue #1 comic cover (left) in comparison to a screenshot from the 2012 cartoon’s intro (right). I’d like to conclude by making some comparisons to the previous incarnations of the franchise. TMNT 2012, is not a satire on gritty comic book stories like the original graphic novel was, nor does it emulate that same dark and gritty style like the 2003 version and some of the movies did. If anything, it’s more of a throwback to the 1987 cartoon, with witty banter, goofy bad-guy mutants, the love of pizza, and modern slang. It even cameos the 87 version in clever ways. It has many trope-y and cliche ridden episodes, and embraces them. It still has crazy action and contains some darker moments, but knows exactly when it should take itself seriously and when it doesn’t need to. Yet what makes this series to rise above the others in my eyes is the emotion in it. There are some heavy moments and great development for each of the characters. They have flaws, worries, and fears, and how they deal with these things go hand-in-hand with dealing with the bad guys. My favorite moments are probably the ones that involve the idea of family and brotherhood, where the show reminds us that these four guys are not only teenaged and mutant and ninjas and turtles, but also brothers. 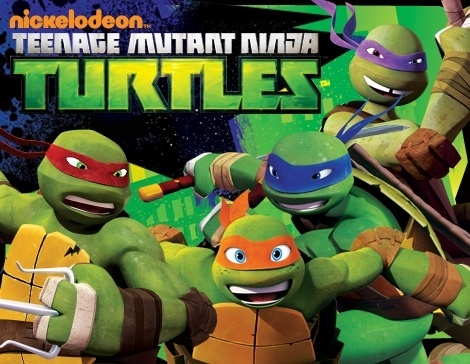 If you are a fan of the Teenage Mutant Ninja Turtle franchise, or even if you are not, I really do recommend this show. It’s got the fun and goofiness that you would expect from a show about mutant turtles, lots of action that you would expect from ninjas, but also some great art, culture, and emotion that you wouldn’t really expect, but you get anyway.